Where do I find a LaTeX template with maximal number of math-related shortcut commands? During my mathematical typing, I find it a lot of hassle having to type in and then proofread. Visually impaired, I'm really slow with my mathematical typesetting using LaTeX. So can anybody please suggest ways to automate my mathematical LaTeX document typesetting? Please also suggest some repository for LaTeX templates for mathematical documents. After reading the answer and the comment below, I thought I should supply some more info about myself. I'm a visually impaired person able to read and write from a distance of only six inches or so, and that too not in sunlight. I'm not comfortable viewing the computer screen with light background and dark text. Rather, I'm more comfortable viewing the computer screen --- and reading the text --- against a dark background, with some amount of text magnification / zooming in. I'm using an Intel Celeron Pentium 4 1.8 GHz processor with 1 GB of RAM and 40 GB hard disk space. My operating system is Windows XP Service Pack 2. For input, I use WinEdit; for compiling, I use MikeTeX. For accessibility, I've turned on the High Contrast Black (Large) option under the View tab in the Display dialog box. It often becomes too cumbersome finding errors in my typed input. Distinguishing amongst the parentheses, the braces, and the brackets; the dollar, the percent symbol, and the ampersand; the "l", the "I", and the "1"; and the like is also quite difficult at times. Here in Pakistan, there aren't many (if there any at all) blind and visually impaired people doing mathematics and latex typesetting, nor is there any organisation to provide any accessibility advice and support to visually challenged students specialising in mathematics and the natural sciences. 2) Screen colors can be configured (foreground and background for several environments) . 3) The math environment is nearly WYSIWYG (show in the screenshot) where you can write like in plain LaTeX but you can see on the fly you the result (i.e., if you type a command like \mu is replaced immediately by the greek µ symbol). 4) Moreover, like Christian Hupfer pointed, there are auto-completion of these command (i.e, if you type \al, LyX suggest \aligned, \alpha, etc. in an emergent menu, but if you type \alp, the appear \alpha in the edited text because is the unique choice, as show in the screenshot). 5) Most usual math symbols and commands are accessible using the icons of the math toolbar. (show in the screenshot) So, alternatively you can simply also select the µ icon with the mouse. The defaults icons may be are rather small for visually impaired people, but it can be configured in three sizes. 6) In case that is not clear what is some symbol in the math toolbar or in the main screen (e.g. That "p-like" is \phi or \rho?) you can see the correspondent command in the LaTeX Source (show in the screenshot) with the menu View. 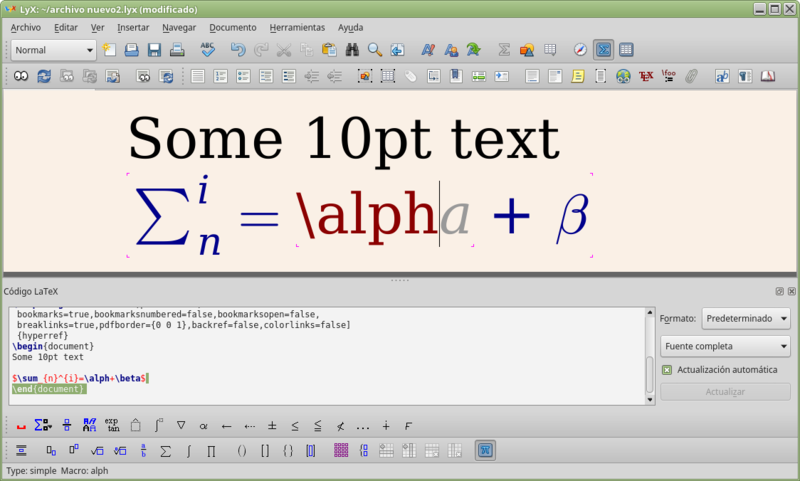 Unfortunately the font of the source window cannot be zoomed, but you can copy a chunk of this source or from the WYSYWYG formula in the main window and paste again in the main window but as normal text so you can will see the LaTeX commands in a larger font. Not the answer you're looking for? Browse other questions tagged automation accessibility or ask your own question. How can I make it easier to write LaTeX documents with elaborate mathematics? Auto images height to get specified number of pages. Is it possible with LaTeX? Can we get maths in PDFs that can be copy-pasted and screen-read?